Bing et alArticle investigated the prevalence of mental disorders and drug use among adults with human immunodeficiency virus (HIV) infection using a nationally representative sample of adults receiving care for HIV in 1996. They found that nearly half of adults with HIV screened positive for a psychiatric disorder, nearly 40% used an illicit drug other than marijuana, and more than 12% screened positive for drug dependence during the previous 12 months. Burnam et alArticle examined use of mental health and substance abuse services in a nationally representative sample of adults with HIV, reporting that more than 60% received some care in the previous 6 months. Challenges in providing appropriate services to this population were revealed, including sociodemographic and regional inequities in access to care, and a heavy burden on general medical providers to respond to the mental health and substance abuse concerns of their HIV patients. Identifying the characterological basis of violent behavior poses a major challenge for psychiatry. Herpertz et alArticle studied emotional responses in an experimental design including 2 groups of violent offenders: psychopaths and subjects with borderline personality disorder. Psychopaths but not offenders with borderline personality disorder showed a general deficit in processing affective information, regardless of whether stimuli were unpleasant or pleasant, reflected by low autonomic responses, little facial expression, and an absence of affective startle modulation. The authors concluded that psychopaths do not experience emotions such as fear, empathy, or guilt that may inhibit violent behavior. Hodgins et alArticle investigated the association of obstetrical complications with subsequent criminal offending in a Swedish birth cohort followed prospectively to age 30 years. They found that complications during the pregnancy interacted with inadequate parenting to increase the risk of offending and violent offending. This combination of factors, however, affected less than 4% of the subjects. By contrast, inadequate parenting affected almost 19% of the subjects and among the males it increased the risk of offending in general and of violent offending to similar degrees. Naltrexone is an important but highly underutilized agent for the treatment of opioid dependence, largely owing to problems with compliance and attrition. Carroll et alArticle evaluated 2 behavioral strategies aimed at targeting naltrexone's weaknesses—contingency management to reinforce compliance with naltrexone and abstinence, and involvement of significant others in treatment to reinforce retention. Contingency management was found to improve retention and reduce opioid use. Cognitive deficits in schizophrenia limit social and vocational function and persist despite current therapeutics. Bell et alArticle evaluated a new treatment that combined neurocognitive enhancement therapy with work therapy (NET+WT) and compared it with work therapy (WT) alone. Pre-post neuropsychological testing showed that patients receiving NET+WT had improved significantly more than those receiving WT on executive function, working memory, and affect recognition. Findings suggest that cognitive impairments are not intractable and their treatment should be part of rehabilitation. Kircher et alArticle used functional magnetic resonance imaging to measure brain activity while patients with schizophrenia were talking about Rorschach inkblots, a procedure that can elicit incoherent speech. The severity of "positive" formal thought disorder was inversely correlated with the level of activity in Wernicke's area, a region that is normally activated during speech production. Spencer et alArticle report that short-term treatment of adult attention-deficit/hyperactivity disorder (ADHD) with a mixed amphetamine salts compound (Adderall) was effective and well tolerated. The results suggest that a twice daily dosage of Adderall may be comparable to methylphenidate using a three times daily dosage. A commentary by Gadow and Weiss Article is included. 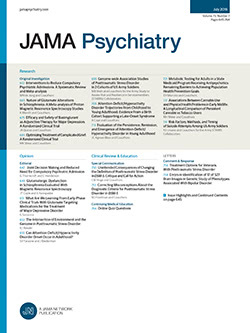 To aid the diagnostic process, Zimmerman and MattiaArticle developed the Psychiatric Diagnostic Screening Questionnaire (PDSQ), a self-report scale designed to assess the most common psychiatric disorders encountered in outpatient settings. Together with findings from other studies, the results of this study of outpatients suggest that the PDSQ is a reliable and valid measure that can be used in clinical practice to improve the efficiency and accuracy of diagnostic assessments.